A captivating and mesmerising collection that epitomises the themes the most dear to the Maison. The vibrant life of Nature, the geometric lines of Art Deco’s Architecture and the refinement of Haute Couture textiles: all is there to celebrate the mystery of creation, inspiration and production, all revealed by 26 Vendôme, Boucheron’s new high jewellery collection. Nature is one of Boucheron’s beloved theme, and here the master artisans were able to capture all its generosity and richness with jewellery creations expressing Nature’s all-powerful dimension. Lys Radiant Necklace. Set with a 20,08 cts yellow pear diamond, 219,06 cts rock crystal , paved with diamonds, on white gold. Necklace in the tra dition of the multi wear. The lily is a legendary flower, symbolising power, majesty and opulence for millennia. Boucheron’s version is imbued with light. It beams. Lys Radiant is first and foremost a necklace. The luminous chain is joined by a superb yellow pear-shaped 20-carat diamond and surrounded by a halo of delicate yellow diamonds. Six rock crystal petals encrusted with diamonds complete the corolla. 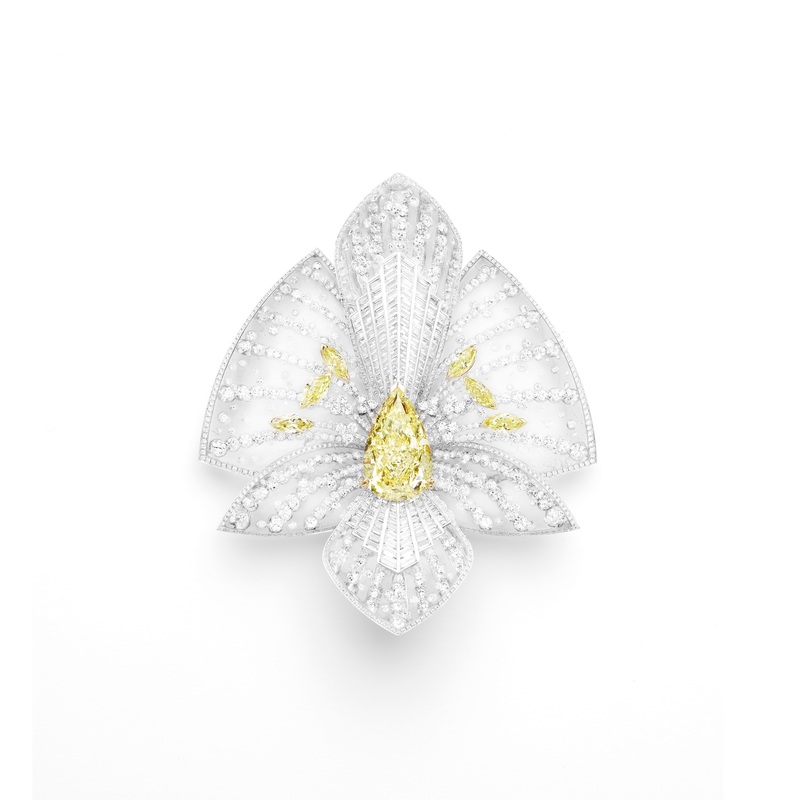 In Boucheron multi-wear tradition, the flower can be detached and worn as a stand-alone piece. Nature is light, but it is also abundance, with the Blé d’été necklace. A new interpretation of the question mark necklace, a Maison’s classic since 1889, the Blé d’été necklace is a vivid portrait of the ears of wheat, so light as if swaying in the wind. Another iconic emblem of Boucheron is the peacock feather, that comes alive in this collection in a diamond-set necklace that also reinterprets the question mark necklace. The set is complemented by earrings, a bracelet, a ring and a brooch, where birds poetically take flight in the distance. A second theme for this collection, and a one I personally love, is the Art Deco Architecture. In the Architecture Inspirée collection the jewels are outlined by pure, clear geometrical lines, a reflection of Place Vendôme columns and arches, and of that Hôtel Particulier where the Maison’s journey began. A major piece in the collection, its alternating pavé-set yellow and white diamonds, grey moonstones, white mother-of-pearl, and lines of onyx recall the graphic pattern of No. 152’s parquet flooring. At its centre, a magnificent 21.80-carat yellow sapphire radiates light like a dazzle of sunrays peeking through half-open shutters. Three rock crystal pendants recreate the view that the apartments enjoyed over the gardens of the Palais Royal. One last pendant represents the starry sky and serves as the necklace clasp. Three bucolic scenes – outstandingly sculpted and comprising hundreds of diamonds – form a romantic, yet realistic triptych of the vistas seen through the windows. In the Vendôme Chromatique et Argentique collection, Place Vendôme’s majestic design and its infinity of perspectives find the ultimate exaltation. A rock crystal bracelet exalts the Parisian square, its profile recalling the surrounding arcades. An engraved emerald-cut beryl of 94,15-carat pays homage to its imposing central column, viewed from above. The necklace displays Boucheron’s unique reinterpretation of the chevron – the ultimate Art Deco motif. Finally, the Damier Cabochon Collection features the classicism of Parisian hôtel particulier designs, and specifically the interior of the Boucheron family residence. Here the geometrical purity of an Art Deco chequerboard pattern is represented with diamonds contrasted against deep black onyx cabochons. The necklace, ring and bracelet all feature a play on the diameters of inset stones, revisiting the Maison’s renowned chahuté technique. Boucheron does not find its major inspiration for jewellery design in Nature or Architecture. Frédéric Boucheron’s parents were drapers, and this plays a strong role by shaping the Maison’s artistic capability of fusing high couture with high jewellery, thus giving birth to one of the most outstanding pieces of high jewellery the world could possibly admire, the Cape de Lumière. It was entirely created on a dressmaker’s dummy to ensure perfect fit, drape and suppleness, and its elements are interconnected by a woven mesh of golden thread. The pattern is a modern, stylised version of a favourite inspiration, the peacock feather, “hand-sewn” by the Maison’s artisan-jewellers. From the chiselled cut of the overall piece to the delicacy of its twisted chains inset with diamonds, this Mantle of Light stretches the limits of jewellery-making further than ever. Textiles and couture mean fluid movement, but the Art Deco’s geometric influence is not that far away when we admire the Plissé Diamants and the Ruban Graphic collections. As a subtle two-colour variation on black-and-white, this new creation stirringly reinterprets the pleats of a fabric in a piece of jewellery that falls around the cleavage like a scarf inset with tiny diamonds. The two sides come together around a 7.8-carat diamond that lets the jet-black spinels on the back show through. Earrings and brooch both recreate this striking perspective effect, worthy of a trompe l’oeil. With the Ruban Graphique, Boucheron revisits the traditional ribbon, paring down its contours to pure lines. A necklace is created from tiny cascading onyx beads that come together in an outsized bow around a 4.4-carat Colombian emerald. When the ribbon wraps around the finger in a delicate ring, it harbours a Colombian emerald of 3.7-carat or a 3-carat ruby from Mozambique. By Claudia Carletti. Material courtesy of Boucheron.